The design is an interface that takes an unpredictable and variable input from an offshore wind turbine and converts it into an output that is smooth and predictable. To date this is a big issue with using offshore wind turbines to supply conventional electrical grids. It does this by storing extra energy for times when there isn’t enough by using compressed air and water, making it clean and suitable for very large scale systems. The invention utilises a well-established hydro-pneumatic accumulator technology and a renewable energy system positioned on a floating support structure with an integrated floating air chamber designed to hold compressed air and to provide necessary buoyancy to the floating structure. The platform will be further supported by a sea-bottom mounted structure, configured to hold compressed air and the deep sea water (DSW) to store the DSW under pressure of the compressed air. The floating air chamber will be pneumatically connected with the sea-bottom accumulator chamber to pressurize the hydro-pneumatic energy storage system with compressed air. The pressurised cold deep sea water is then transported to shore for the purposes of generating electricity and cooling. The invention makes use of existing infrastructure, the floating platform and anchoring system, to maximise the benefits from offshore renewable energy installations. 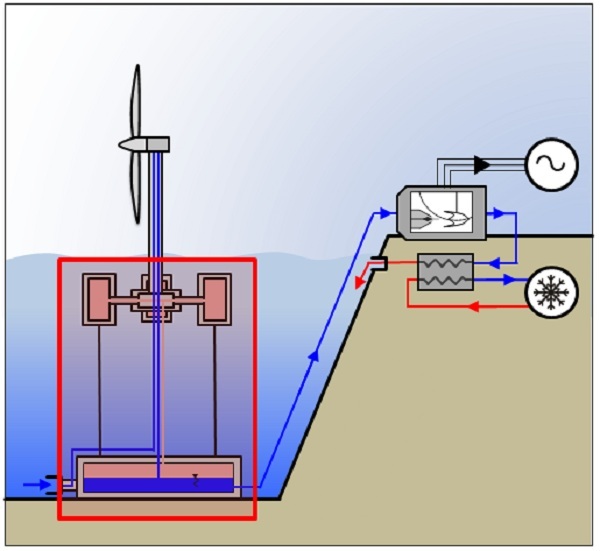 This makes wind energy a more feasible solution by overcoming issues with intermittent signals when connected to the grid, with the added benefit of heat exchange using cold deep sea water. The invention seeks to explore the fundamental advantages offered by hydraulic power transmission in the context of wind energy over the conventional gearbox-equipped wind turbines, which have known reliability issues related to the inability of a turbine gearbox to cope with uneven loading of the rotor blades resulting from random gusts of wind. Current solutions for the storage in deep sea conditions and the transportation to the shore of offshore renewable energy faces challenges and have their limitations being expensive, requiring periodic maintenance and replacement as well as sometimes using hazardous components (in case of batteries). The system can be adapted to wave, tidal and floating PV installations and is not restricted to wind turbines. Such a system is is ideal for sites with good low speed wind, deep waters and a high demand for cooling (warm climatic conditions). The technology is in the early stages of development (estimated TRL 2-3). The concept of the invention has been proved by mathematical modelling and the essential components have been tested separately and have been shown to work on a lab scale at the proof of concept stage. The construction and testing of the prototype at 1:10 scale in coastal waters is the next step. Patent pending. A patent application (no. 237204) was filed on the 12th February 2015 with the Israeli Patent Office. This has been converted to a PCT application (no. WO/2016/128962). We are looking for licencees and collaborators to construct and demonstrate a full-scale prototype to prepare the technology for commercialisation. Interested? Contact Andras Havasi or the Knowledge Transfer Office.